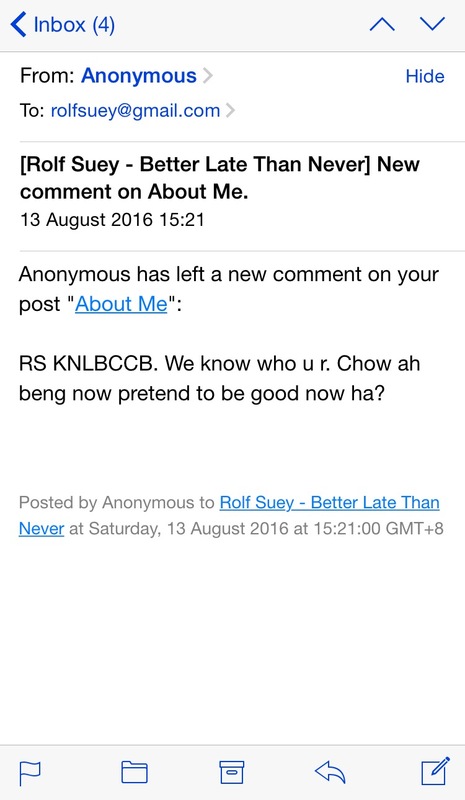 From a harmless and supposingly educational blogpost on Croesus Retail Trust from another blogger LP, refer here, one Anonymous reader gets agitated and accused us of "personal attacks." Seeing the injustice and unreasonable situation, we reasoned back. Especially me, who cannot stand injustice around, talked more. However all comments were well-reasoned and well-manner without any personal attack, let alone vulgar language. Nonetheless, as expected when an Anonymous Coward run out of reason, he normally resort to harsh or vulgar comments without logic. So in LP's blog, we were called "bastards"! Instead of retaliating with vulgar language, we apologised. The usual me added a bit of sarcasm. 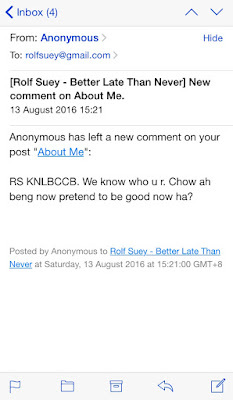 So there you expect it, that coward Anonymous reader whoever he is responded in my blog "About me" page, vulgar comment. This is the first vulgar comment in my blog after more than two years. I deleted it but that does not mean I am weak or I am afraid. But hereby, I print screen the page sent to my email by that Anonymous coward. By the way, all I want to say is I am not afraid of speaking the truth, and it remains that I will never resort to vulgar language to fight back, nor any threatening tone. Still, while that guy think that he is Anonymous, he forgets that if I really want to track, I will do all I can to track his IP address. If he comes again and becomes overboard, I will not just stay still. To rascal, sometimes you also cannot be too kind. Anyway, I still extend my compassion and apologies to that Anonymous reader whoever he/she is. Hopefully one day he can see the light! N first law: "object continue in line of motion unless acted by external force"
Invert? Or issit 3rd law? Haha... I want windfall, not just wind lar. This I must thank LP. "Those who speak the truth will be persecuted"
I know but I m not at all afraid nor worry. Already seen that in my Ah Beng world when young. In work, I seen same people also, but I m still the same me, and it does not hurt me. Instead I becomes stronger. I wonder what's so angry or agitated about this? Not happy don't read loh, no need to get all upset about it, isn't it? in fact I am surprised that it only took so long to happen. Hahaha.. considering the fact that we do not need prior approval before people post comments. I think I know why he so agaited. Quite confident it's a he. It happens at value buddies before. It's all Ego la. They think they know everything, but when shown a different perspective, they try to dismiss others, when the dismissal doesn't affect us, because we have conviction, it affect them instead ... LOL. If u try to reason using "reasoning and fair perspectives" it is fine. It's not just ego, but also when we reach a point when our reasons are not strong enough (simply means we were proved wrong by reasons), then this is when people resort to abusive language or emotional Attack. The problem with human beings is even when we were proved wrong by valid and fair and calm reasoning we cannot accept. This is called stubborn and not ego! I do not mind ego if u have sufifcient VALID reasons and good perspectives to refute! If someone proves me wrong by true valid reasoning, I can accept and willing to apologise. This is the difference I guess! I think it was .. a little less than a year ago when I first sent you that email? Time flies! We know why we write. Nothing else matters. Yes I remember your kind initial email. This is one of a kind out of the ~2.5 yrs of my blogging. and its not difficult for us to see why a person is different in a good way. So sometimes it's not difficult to tell a person. This is one way, another is by who they look behaves, talk and write. as long as we are not blinded by ignorance, emotions and greed (personal agenda) we can easily tell if a person is true or not. I used to get a lot of agitated comments from Anons in the past, but after I spelled out my blog commenting rules, I've felt that my comments are usually more constructive. It's just the spam bots that get on my nerves now, but it's definitely a whole lot less stressful to deal with, haha. Thanks for the suggestion of the commenting rules. Haha. but if Anons are already agitated and blown away and maybe they will not read the commenting rules. I think a lot have to do with what are the topics we discussing also. Anyway the Anon got agitated at LP's blog, which I admitted was probably partially inflicted by me n Lp. Then he/she came over to deface me at my about page. So it was a "deliberate abusive attempt". The best way is to ignore them. You are wasting your energy to reason with these people. And do not ever let their comment affect your emotion, stay cool. Anyway, I enjoy reading your blog. Keep it up. Thanks for reading and commenting herewith. The reason why I reasoned is I still hope that there is hope! This is because of my beliefs that all humans are born inherently innocent and kind hearted, it is only the system of today that corrupts one's mind! Vulgar means unanticipated,indecent and nonplussed also. Someone who is vulgar had bad taste and could be also unrefined and unsophisticated. Many people believe that there's an important difference between things that are sexually frank and things that are vulgar.